Can you supply an ink carrier for this unit please? The part number is 14N1483? The item code 14N1483 relates to the Lexmark 100 series printhead for the Lexmark Pretige Pro805 printer. Unfortuantely, we don't stock this item and can only currently supply you with the Lexmark Prestige Pro805 ink cartridges that are listed on this page. We advise you to contact Lexmark directly for help in sourcing this item. Have you been looking for the very best offers on cartridges? Then you should have a look at just what exactly Cartridge Save has to offer you! We specialise in the supply of nothing except the best-priced Lexmark Prestige Pro 805 ink whilst ensuring you receive our fast online shop. Browsing all day just for the best printer cartridges is an easy way to waste your precious free time Now you can quit spending time looking at rates because all the best prices can be found here. So start saving some money and spare time, buy with Cartridge Save now! You can have total peace of mind if you place an order with Cartridge Save because of our free returns policy, which comes as standard . If you ever have issues using your cartridge within 12 months of purchase you simply have to send it back for a full refund. Remember that we provide absolutely free overnight delivery on any Lexmark cartridge. You no longer have to spend any more hours looking for the the cheapest prices -- you've found them at Cartridge Save. A high-end all-in-one, the Lexmark Prestige Pro 805 produces good-quality photos and graphics and can create scanned images with high resolutions of up to 1200x4800 dpi. The Lexmark Prestige Pro 805 also boasts auto duplexing and uses Lexmark's 4-ink technology, which means more realistic-looking photos. The machine is relatively inexpensive to run, although it lacks fax capabilities, which comes standard with other multifunctions. The Lexmark Prestige Pro 805 not only comes with an auto duplex unit but an assortment of connectivity options as well. It supports USB 2.0, Ethernet, and wireless networking, and its PictBridge port can be used for direct connection to compatible devices. There are also several memory card slots integrated in the Lexmark Prestige Pro 805, allowing users to print and scan, PC-free. The machine likewise features a 4.3-inch colour display equipped with touch screen technology for easier navigation. The Lexmark Prestige Pro 805 boasts reliable print speeds of up to 30 ppm. Vibrant 4x6 inch photos come out in less than a minute, and copies come out as fast as 25cpm. Types of print media supported range from photo paper to envelopes, and even cards and matte paper. In addition to the auto duplexer, which saves paper usage by 50%, the printer also uses individual ink tanks, which means less ink waste. 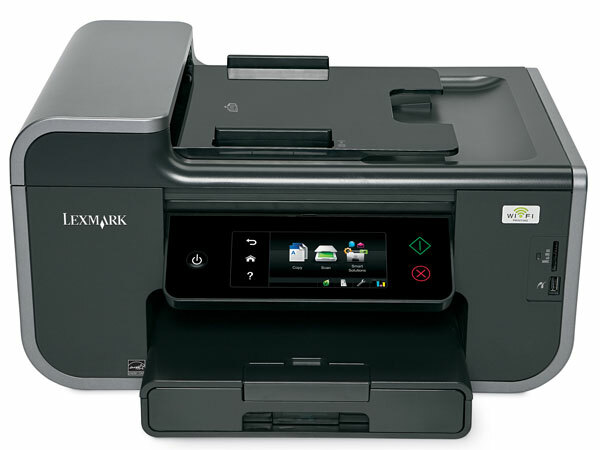 The only problem with the Lexmark Prestige Pro 805 is that it lacks fax capabilities, which many people look for in all-in-one devices.